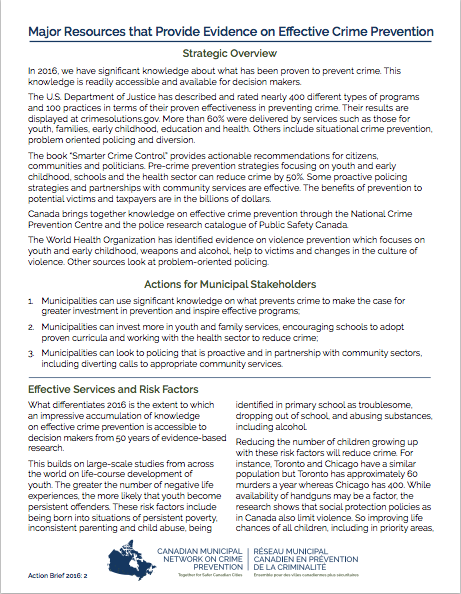 These summaries provide easy access to evidence on crime prevention and illustrate actions to be taken by elected politicians, senior municipal officials, police executives, community safety coordinators, and citizens. 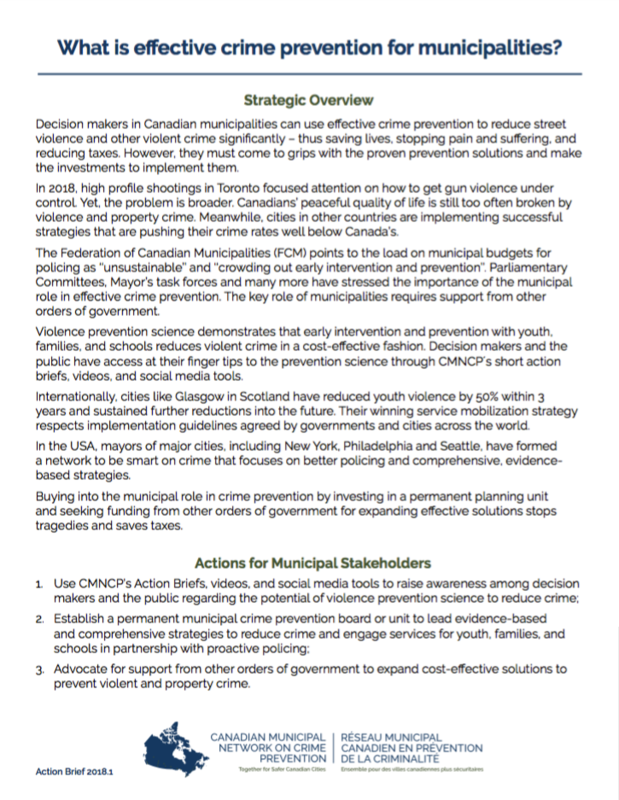 Decision makers in Canadian municipalities can use effective crime prevention to reduce street violence and other violent crime significantly – thus saving lives, stopping pain and suffering, and reducing taxes. However, they must come to grips with the proven prevention solutions and make the investments to implement them. Click here to view Action Brief. To achieve these targets, the SDGs require all orders of government to implement more e ective ways to stop violence before it occurs. Effective crime prevention strategies begin with diagnosing the incidents and causes of crime through local safety audits. 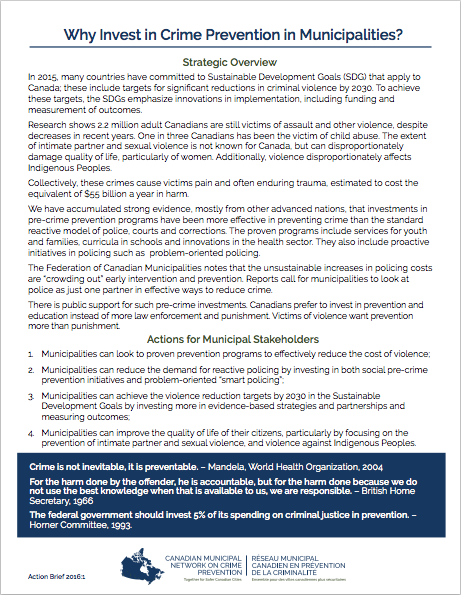 Municipalities need to invest in identifying the local causes of crime in order to make informed decisions about priority issues. Feedback from across the country shows that Canadians increasingly demand that ALL orders of government dedicate resources to where we can have the greatest impact for the most number of people in both the short and the long-term. Municipalities face street violence, violence against women and property crime as well as unsustainable increases in policing costs. Scientific evidence confirms that prevention has reduced these problems. 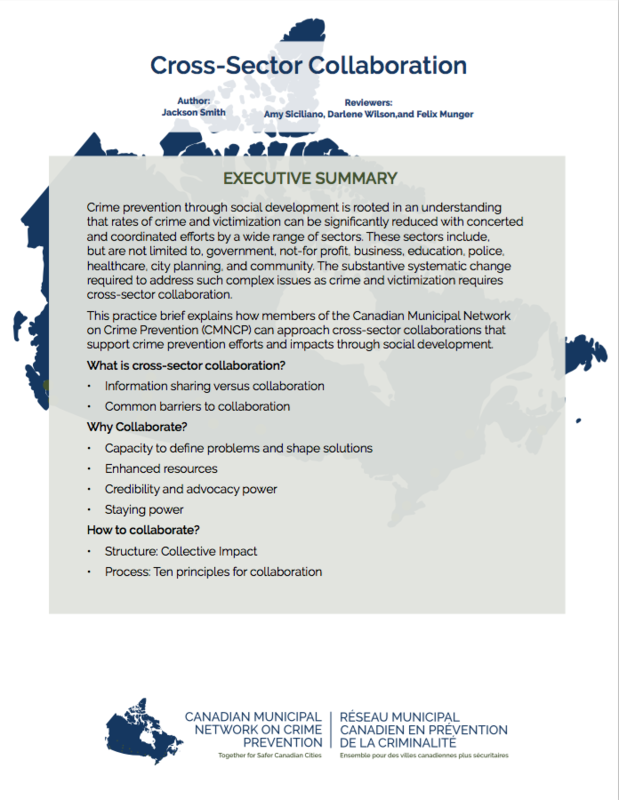 The challenge is getting more investment in prevention in more municipalities. Interpersonal crime does $55 billion in harm to citizens annually. 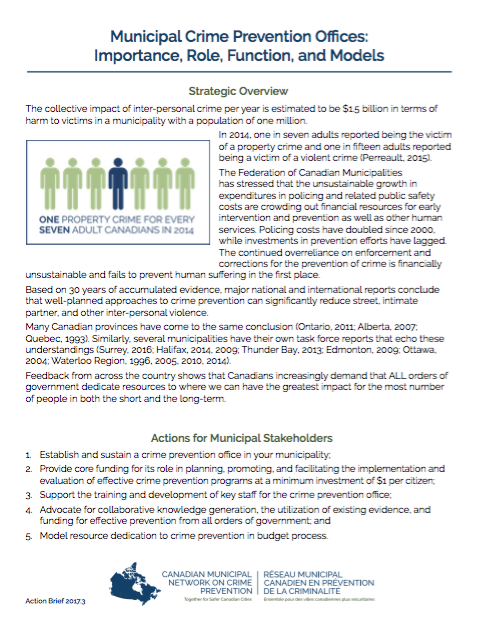 The accumulated evidence justifies smart investments in prevention as the most cost effective way to reduce crime. The majority of Canadians support these investments. The evidence on what prevents crime is accessible in a guide to politicians on Smarter Crime Control and on major websites. 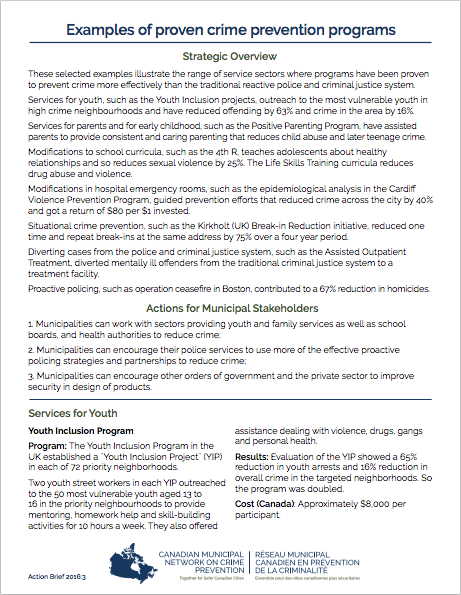 Proven programs are in sectors such as youth and family services, schools and health as well as in policing. Examples of successful prevention programs include outreach to vulnerable youth, support for parents, school curricula focusing on relationships, social prevention from hospital emergency rooms and preventive policing. Internationally some municipalities have reduced crime by 50% or more by targeting social development and preventive policing into areas of high crime and disadvantage. Their successful strategies included diagnosis and evaluation of results. This action brief is organized into two major themes. 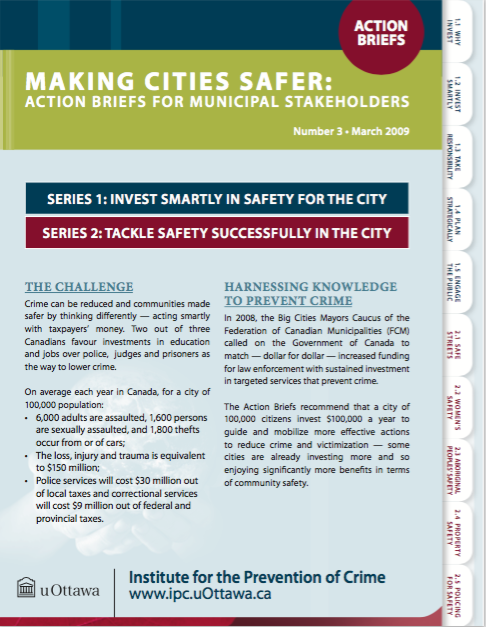 The first theme, series 1: “Invest smartly in safety for the city”, articulates why cities should invest in crime prevention and discusses strategies for ways in which cities can invest in crime prevention. The second theme, series 2: “tackle safety successfully in the city” discusses strategies for improving safety and reducing violence and crime in various populations (i.e., youth and young adults, women, Aboriginal people) as well as reducing property crime and utilizing policing resources more efficiently and effectively. 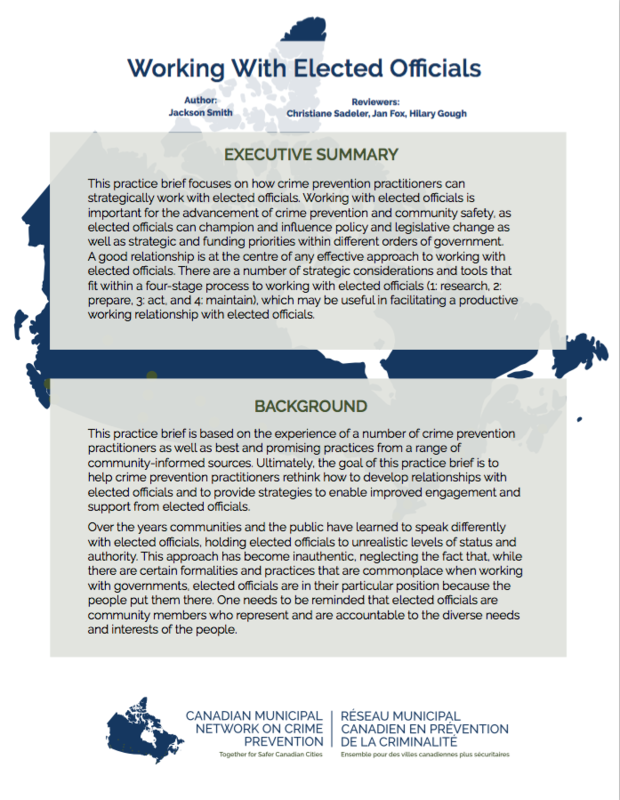 CMNCP has developed a practice brief to support members in working with elected officials. Click here to view Practice Brief. CMNCP has developed a practice brief to support members in working with developing cross-sector collaborations. 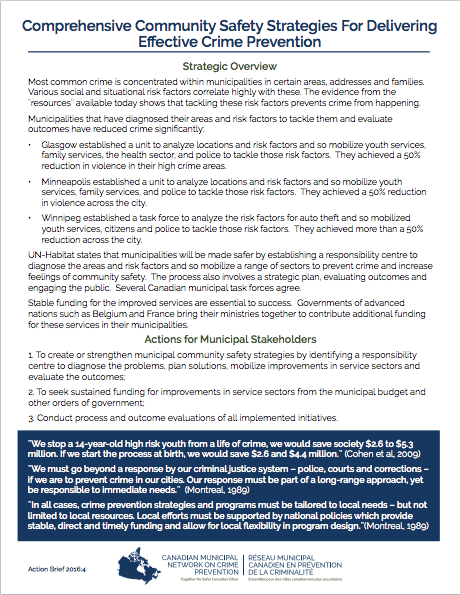 CMNCP has developed a policy brief to demonstrate the need for increased investment in crime prevention in municipalities. Click here to view Policy Brief. We have listed links for websites that may be useful in Canada, USA and internationally. 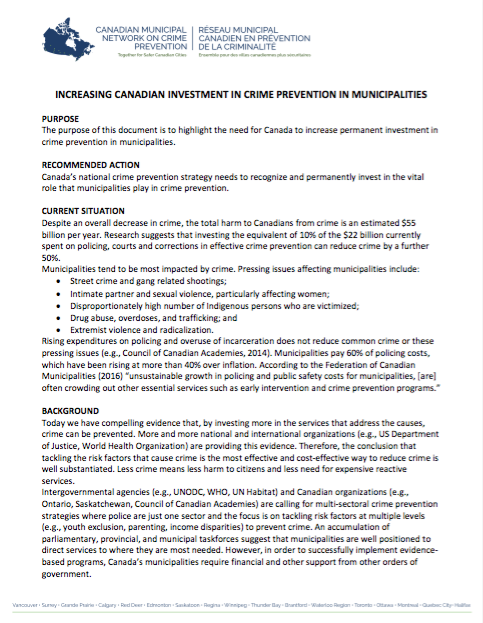 The Action Brief 2016.2 explains ways to use some of the most important Canadian and international websites to advance investment in evidence based crime prevention. 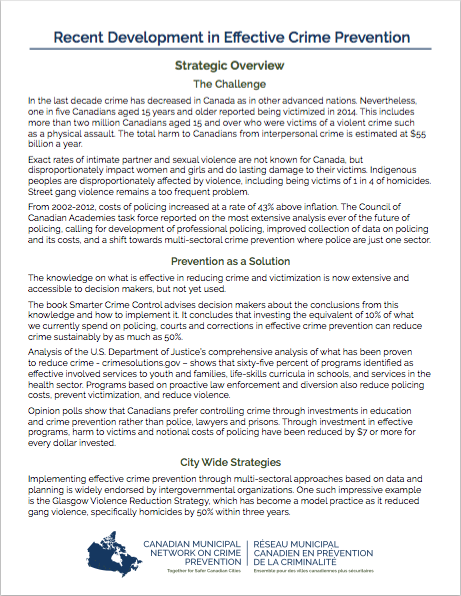 The National Crime Prevention Centre (NCPC) has put together a list of proven crime prevention programs. The Police and Community Research Catalogue is a repository of all the policing related research, consolidated and made available to the policing community, policy makers and the public. Prevnet provides information on the programs to prevent bullying and promote violence prevention. The Center for the Study and Prevention of Violence in Colorado vigorously reviewed over one thousand programs that target risk factors before identifying its top eleven Blueprints-certified programs. The Centre for Disease Control has launched an interactive and user-friendly website on how to implement evidence-based research in policy making. The Problem Oriented Policing website compiles data concerning situational crime prevention and proactive policing techniques proven to be effective. The US Department of Justice maintains CrimeSolutions.Gov, which is an evidence-based website with an extensive list of 400 programs and 100 practices. The Washington State Institute for Public Policy is an important source for policy makers as it systematically reviews evidence on the cost-benefit of programs that tackle crime. The Substance Abuse and Mental Health Services Administration, aims to alleviate the impact of problematic substance use and mental health issues by providing information on research and a variety of services. Youth.gov brings together 18 federal agencies that aim to support youth services and programs by identifying effective strategies and increasing organizational collaboration to prevent and/or reduce delinquency. They collaborate with the Youth Justice Forum on Violence Prevention. The Campbell Collaborative is an international research network that produces systematic reviews of the effects of social interventions of crime and justice. The European Crime Prevention Network is a knowledge center that identifies good practices, and evaluates and promotes crime prevention activities. 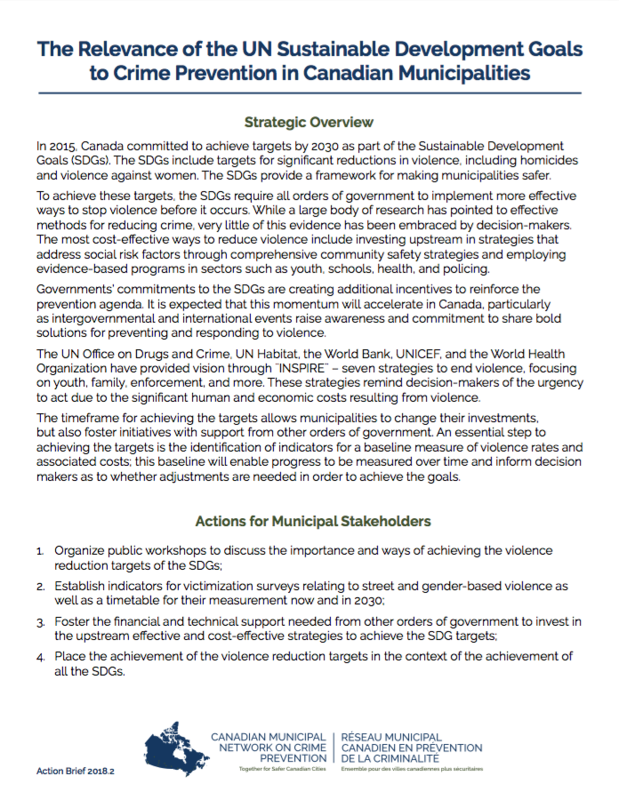 The UN-Habitat Safer Cities program provides guidelines and a knowledge base for municipal crime prevention. The World Health Organization (WHO) has developed a number of useful resources on the prevention of violence. The European Forum on Urban Safety (Efus) is the only European non-governmental organization of local and regional authorities dedicated to urban safety. It includes nearly 250 local and regional authorities from 16 countries. Institute for the Prevention of Crime. (2008). Canadian Strategies and Practices (Making cities safer; no. 2). University of Ottawa, Ont: Institute for the Prevention of Crime. Institute for the Prevention of Crime. (2007). International Strategies and Practices (Making cities safer; no. 1). University of Ottawa, Ont: Institute for the Prevention of Crime. Institute for the Prevention of Crime. (2007). Building a Safer Canada (National Working Group, no. 1). University of Ottawa, Ont: Institute for the Prevention of Crime. Waller, I. (2014). Smarter crime control: A guide to safer futures for citizens, communities, and politicians. Lanham, Maryland: Rowman and Littlefield. We have compiled an extensive list of bibliographical resources, including references for crime prevention evidence in Canada, USA, and Internationally. Click here to download the bibliography.